A few weeks ago I went down to California for a dear friend's baby shower. It happens to be the same dear friend who shared this recipe for Thai Basil Meatballs and she might be the cutest pregnant lady that's ever lived. Seriously adorable. Well, she and I share another sweet friend, who happens to be the one responsible for this fool-proof crisp. The company and the food is always so good when I'm around these ladies! 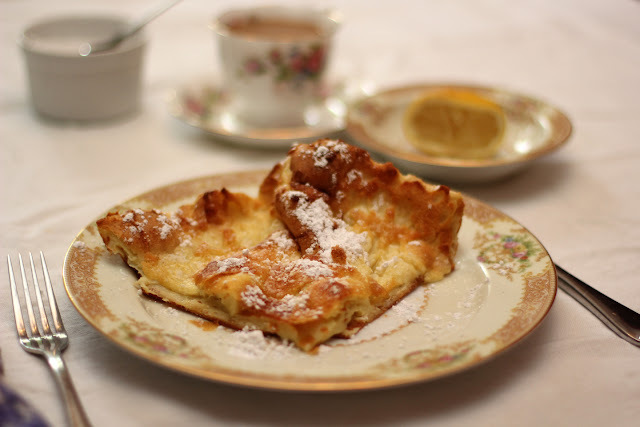 Jenny made Jeannette's recipe for Dutch Baby Breakfast and it was wonderful! Sort of like a crepe, but easier; sort of like a pancake, but fancier; sort of like a souffle, but not scary. The prep is almost zero, and the bake time is only 25 minutes. Perfect. In a blender, combine 1 cup flour, 1 cup milk and 4 eggs. Beat until well incorporated and a bit frothy. About a 30 seconds did the trick for me. Melt 1/4 cup of butter in a cast iron skillet. 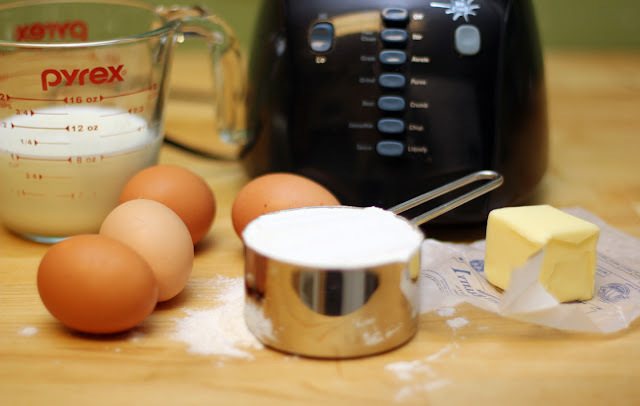 Pour the batter into the skillet and transfer to the oven and bake for 25 minutes. Peek at it around 22 minutes. Seriously. This is the easiest breakfast ever. I cut our pieces right in the skillet using a pizza cutter. I didn't bother trying to place this on a serving dish as the center starts to deflate quickly. 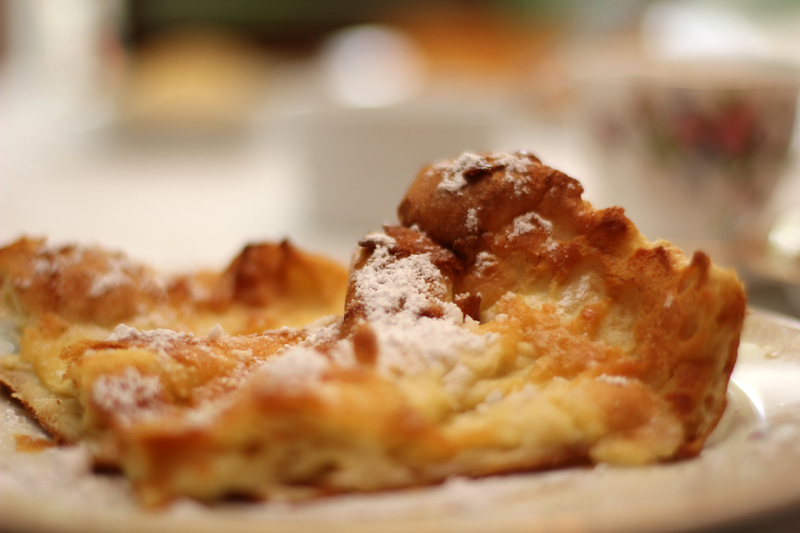 Top with lemon juice and powdered sugar and devour! I've been told that this DOES NOT WORK unless you blend with a machine. Netty has tried blending with a whisk and the Dutch Baby didn't puff up. Making my first round I blew up our ancient blender... the Magic Bullet worked just fine, just had to blend in two rounds. As we were sitting around enjoying our gorgeous breakfast and admiring Jenny's adorable bump, Jenny's mom told us she's diced up apples and added them to the butter before she pours on the batter and then tops with cinnamon. Sounds awesome to me! We also discussed that since this is a neutral batter we could possibly go to the savory side of things and saute ham in the butter before pouring on the batter and then top with grated cheese. Fresh berries or jam or whipped cream also seem like nice toppers. Options abound.